It hurts because it's just so damn stupid. A total fluke that completely changes the not only the outcome of the game, but the trajectory of the season as a whole. In one nonsensical play, Michigan went from being 6-1, a top-10 team, and a legit contender for the college football playoff...to not so much anymore. It hurts because Michigan and Michigan State were heading in completely opposite directions as programs. And this outcome stunted that movement...if even for a short while. Now, it seems it's the Spartans who are back in the college football playoff discussion instead of the Wolverines. All because of one mishandled snap. I don't exactly know what to write here. I didn't want to write anything yesterday because there was no way I was going to try and string together coherent thoughts after that chaos. After the play, the pressbox remained relatively still for a good couple of minutes. Even the media folks couldn't believe what we had just seen. And even now, I'm struggling to comprehend everything that happened in those final 10 seconds. The low snap coupled with the gravity of the situation probably just screwed with Blake O'Neill's mental cadence just enough to throw him off. Run that play 100 more times and O'Neill gets that punt off no problem. Should he have just fell on the ball? Yes. Would a more traditional punter have just landed on the ball? Maybe. But O'Neill's aussie-style punting ability maybe gave him a little more confidence that he could still make a play. I mean, the kid had been having a great game...an 80-yard punt, 3 punts inside the 20. He's a confident kid. He wanted to make a play. And then what happened afterwards. 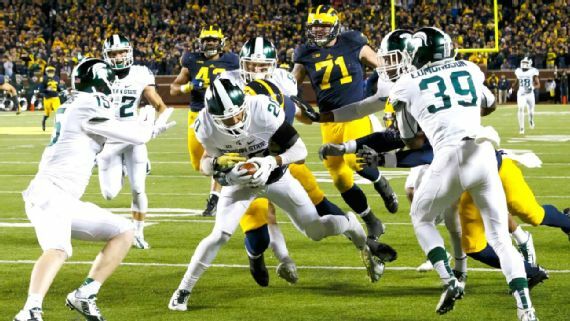 Had Jalen Watts-Jackson been tackled anywhere inside the 20, the game would've ended with Michigan winning 23-21. But he had just enough blockers to help guide him all the way to the endzone. Since the moments shortly after, you know...that happened...I've been trying to compare this to some of the other historic low-blows Michigan has received over the years. Colorado, Appalachian State, Toledo, etc. And frankly it's hard to compare this to those. Those other plays were...well, plays. Plays in which Michigan got beat because of things that, while awful, at least made sense in a general football sort of way. Last night, that ending transcended sense. Even Michigan State fans can't fathom how it all went down. It's the true definition of a fluke outcome. According to ESPN this morning, Michigan had a 99.8% win probability before that punt. It was so out of the realm of possibility that MSU's staff actually put the Paul Bunyan trophy in the doorway of Michigan's locker room. MSU didn't line up a returner, so had O'Neill got the punt away, the game would've likely been over right there. 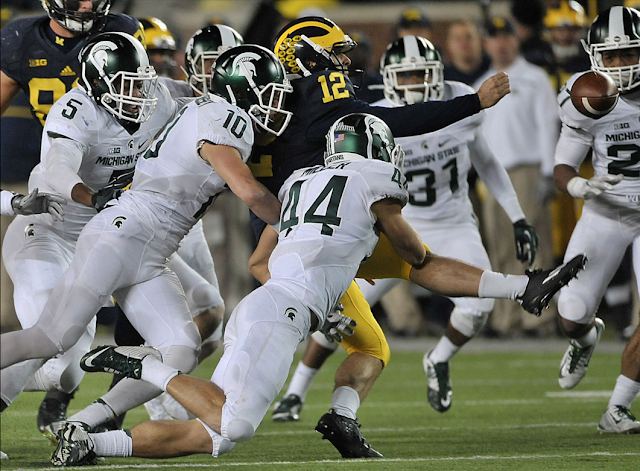 Michigan State's ONLY hope was to block the punt or have the snap botched. Without a doubt, the craziest ending I've ever witnessed. So, now what? Where do we go from here? Michigan can look at this game and find positives. Despite being outplayed by Connor Cook (who had a day) and Michigan State's offense, Michigan can still hang their hat on the fact that they were in position to win this game...I mean, it was basically over. Despite the very, VERY poor officiating, Michigan was able to move the ball and score points and keep Michigan State out of the endzone just enough. Compare this to the previous two years against MSU and you can't help but find progress there. Sure, this MSU team isn't quite what they used to be, but they played like it yesterday...because of course they did. Michigan has a bye week to rest up and heal, both physically and emotionally. The only thing they can do from here is rally as a team and get back up. But that's not going to be easy after this historic gut punch.